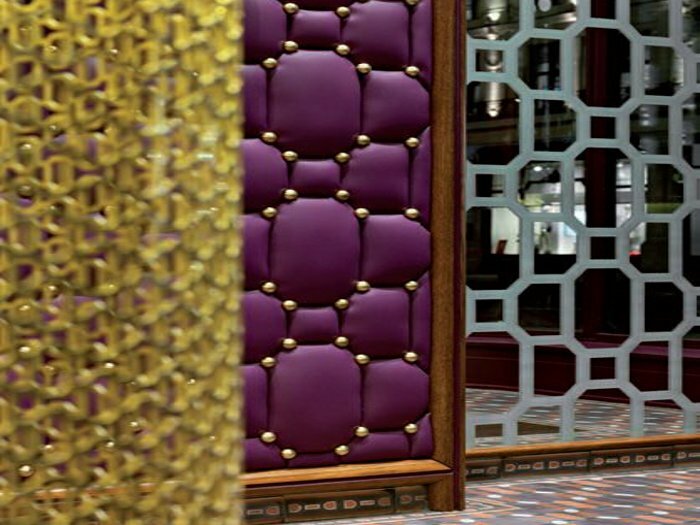 Since he founded his design practice in 2010, Christopher Jenner has been busy making his name synonymous with finely crafted, luxurious interiors. 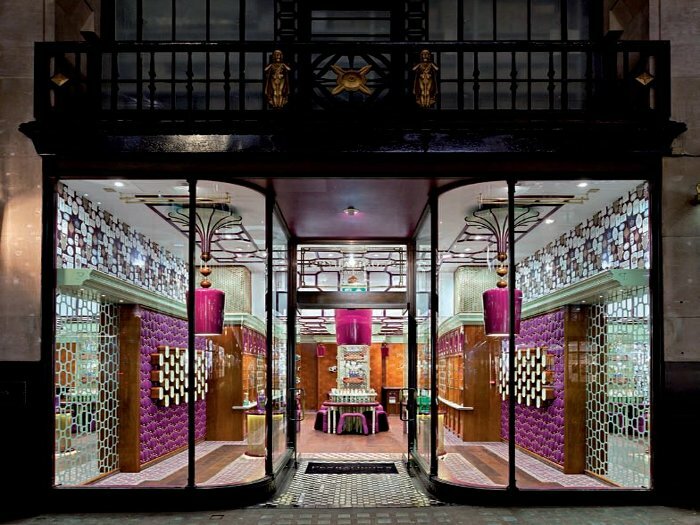 In fact you could say that the South African-born designer, now based in west London, has carved his reputation in Carrera marble as the go-to-guy for luxury retail design, with projects that include the flagship store of luxury candle brand Dyptique in New York and now a very special store for venerable London perfumer Penhaligon's in Regent Street. Blending influences as diverse as Beaux Arts and Japanese Manga, and pairing Jenner's own-designed furniture with luxurious materials and traditional craft techniques, including marquetry, the project bears all the hallmarks of Jenner's signature style - a fusion of old and new, classic and modern, understated and eccentric. 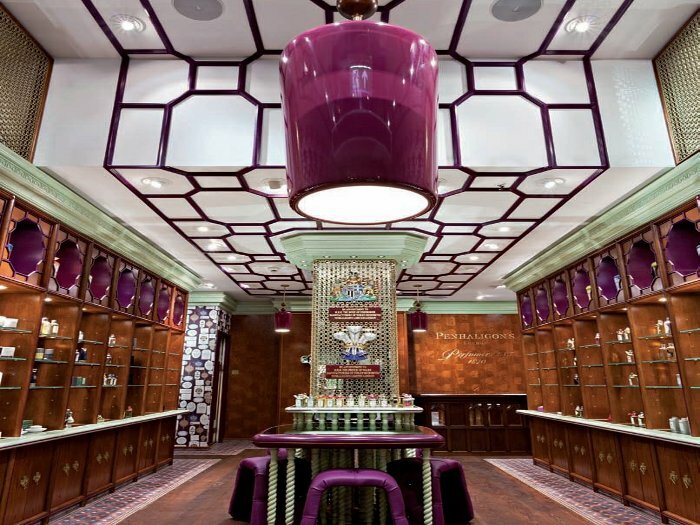 This is not Jenner's first project for Penhaligon's - he has already designed a store for the brand in Singapore - but Jenner sees this one as something of a landmark - 'the next chapter for the Christopher Jenner studio, establishing its success in the world of "sensation design" and demonstrating its strategic, creative technique in exploring the relationship between brands, emotion, luxury and craft', he declares. 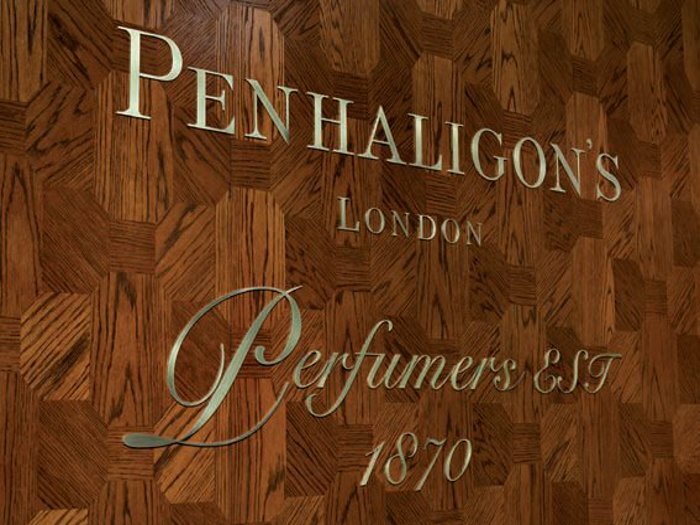 Founded in the late 1860s by William Henry Penhaligon, the brand Penhaligon's gave Jenner plenty to draw on for the design, including the ideas of the Aesthetic movement, which emerged in Britain around the same time as Penhaligon's and championed the pursuit of beauty over all else. 'The project is an assembly of these values created through a collection of pattern, form and texture in a synthesis of traditional English handcraft and high-tech manufacturing,' says Jenner. Walls of purple padded high-spec vinyl flank the store's entrance and are punctured by small, chamfered lightboxes made of white oak and finished in polyurethane paint. 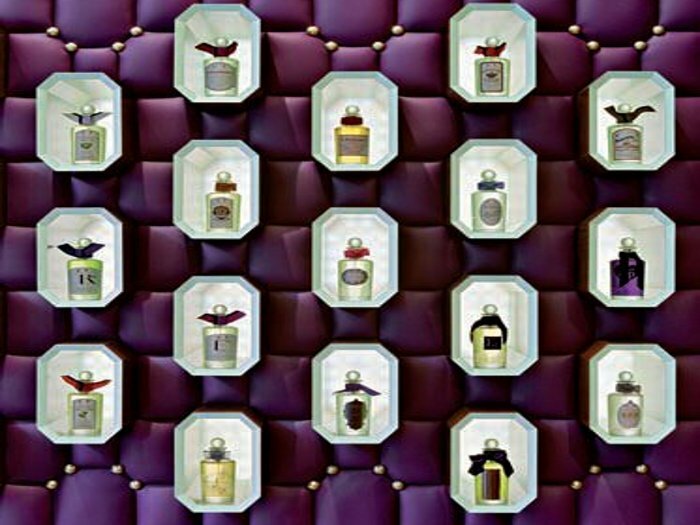 Each lightbox contains a single bottle of perfume, lit from behind. Roses carved in poplar and inspired by the decoration of the fan vaults in the VII Chapel at Westminster Abbey decorate the ceiling at the entrance to the store, giving way to a Tudor-style fretwork ceiling hung with glossy Brighton Pavilion 'onion' dome' chandeliers. All furniture is bespoke and made in England and includes mirror-topped display tables whose individually turned, spiral-shaped legs are made of poplar. The Penhaligon's brand is referenced in repeat patterns, etched motifs and hand-carved relief features that include cabinet door-handles featuring a gold 'P' motif. 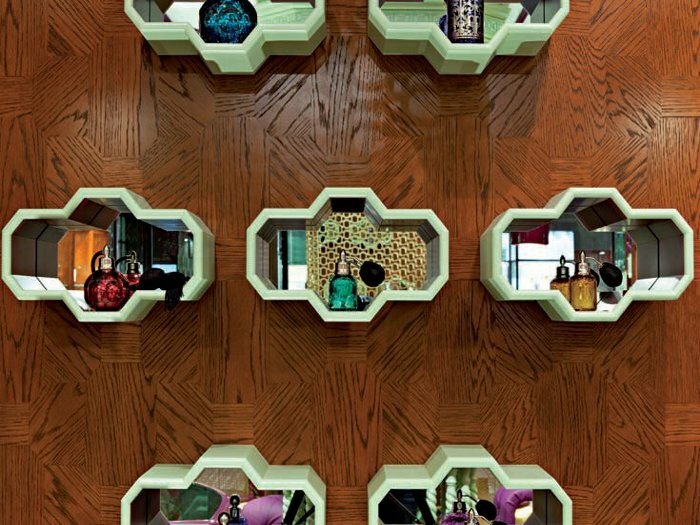 More perfume bottles are displayed on two specially designed low drum tables, made using a single sheet of brass laser cut to a bespoke pattern and formed to create a support for the polished wood base and wood-framed glass top. The cash desk is a reclaimed Victorian bar that has been refinished and fitted with antique mirror panels, drawers and cupboards. The floor has sections of European ash surrounded by hand-made tiles in a traditional Spanish style. A Victorian-style mosaic section inset into the floor at the front of the store contains French ceramic tiles and laser-cut brass lettering. 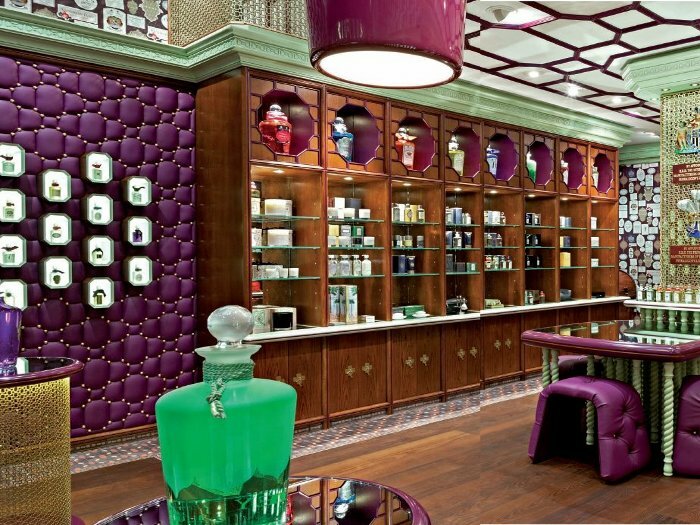 Given a big-enough budget, any designer can fill a room with fine materials and hand-made furniture, but Jenner says that the real success of this project is in the way the design brings the Penhaligan's brand to life and represents the history and culture of the brand in a three-dimensional environment. 'I think that working with ethnographic and cultural influences of the brand creates work of depth and resonance, while the employment of craftsmen throughout the design added definite emotive values to the work,' says Jenner.